Robotnik creates a robotic version of Sonic dubbed Pseudo Sonic, complete with all the hedgehog’s speed and skills. Making matters worse, the real sonic accidentally wandered into a poison sumac patch and becomes unconscious. 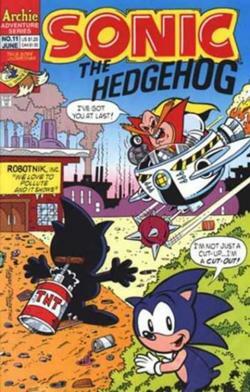 Believing the robo-sonic to be the real hedgehog, Pseudo Sonic seems poised to spoil the entire future of Knothole Village and planet Mobius! 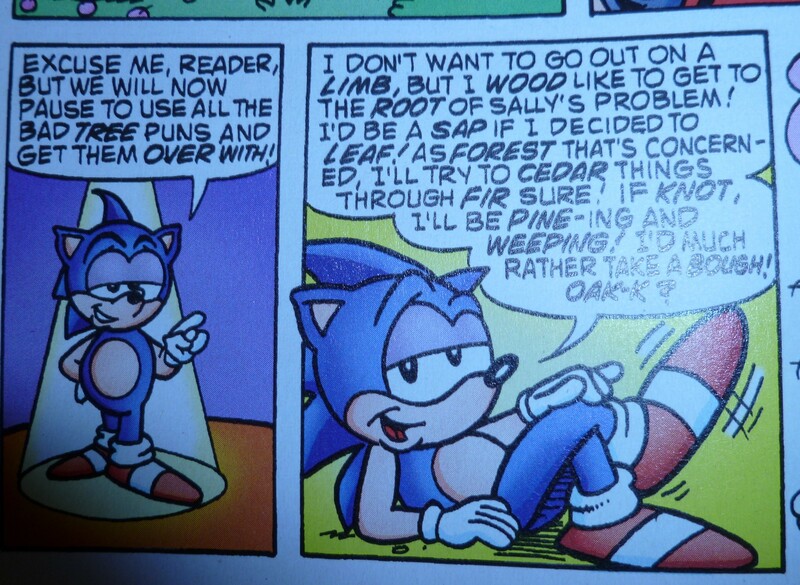 – In What’s the Point?, Sonic pulls aside the reader and points out all the tree puns they could make during the issue, breaking the fourth wall. When Sonic and the Freedom Fighters get trapped by Robotnik, it looks like all is domed until the gang is saved by a strange race of creatures called the Nerbs. Reluctant to move from their underground safe zone, the Nerbs must help Sonic and pals defeat Robotnik’s dastardly digging machine or face extermination! – The first issue where Antoine speaks with his signature French accent. All previous issue his dialogue was written with a plain English accent. Sonic takes the Cosmic Interstate to get to Sally and the others faster, but ends up in a whole new plane of existence. 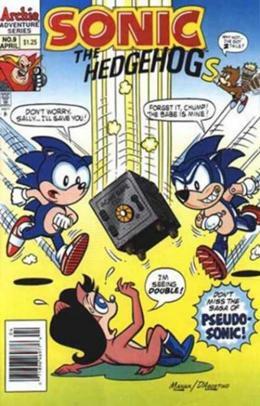 In this bizarro Mobius everything is flipped, meaning Robotnik is a good doctor, and Sonic is evil! The good Sonic has to not only get back to his own world, but deal with Evil Sonic as well! 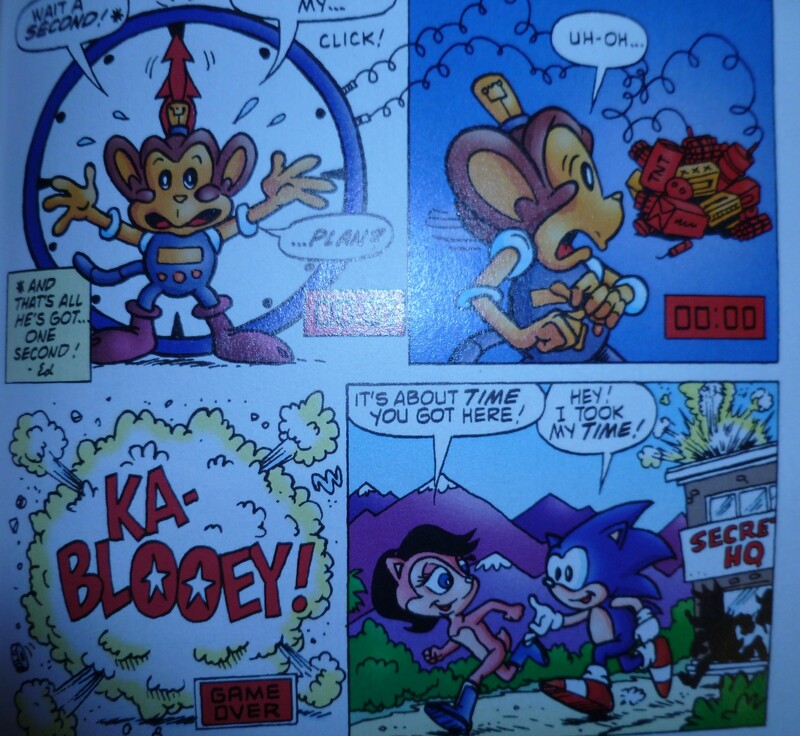 Coconuts the monkey, one of Robotnik’s baddies, has developed a new plan to eliminate Sonic. Having already captured the other Freedom Fighters, Coconuts reviews all of Robotnik’s past mistakes and thinks he has discovered just how to beat Sonic. After a late night chili dog binge, Sonic has a nightmare in which all of the characters in Mobius have been transformed into food! And now the Hamburger-Robotnik has captured the French Fry Tails! – Other roads in the Cosmic Interstate say “Penny Lane,” and “Abbey Road,” referencing Beatles’ songs. 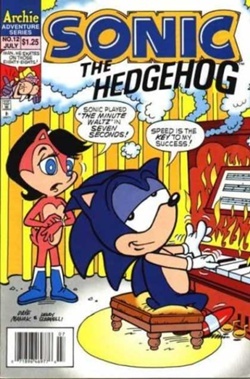 Sonic also says, “No time to take a magical mystery tour,” also referencing Beatles music. – A third road is called, “Lois Lane,” a reference to Superman’s love interest. – In Food For Though or You Are What You Eat, Sonic is a chili dog, Sally is an ice cream cone, Tails is a box of french fries, and Robotnik is a burger. Strangely, the only character to appear in the dream and not be depicted as food is Coconuts, but he is eating a banana. 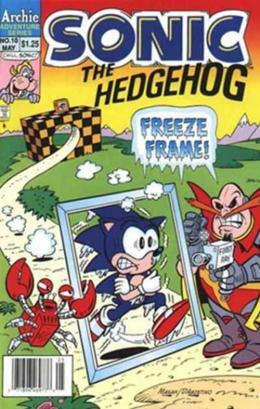 When Robotnik sends Sonic back in time to the Stone Age, the blue blur receives help from a prehistoric ancestor who has his own nemesis to battle. 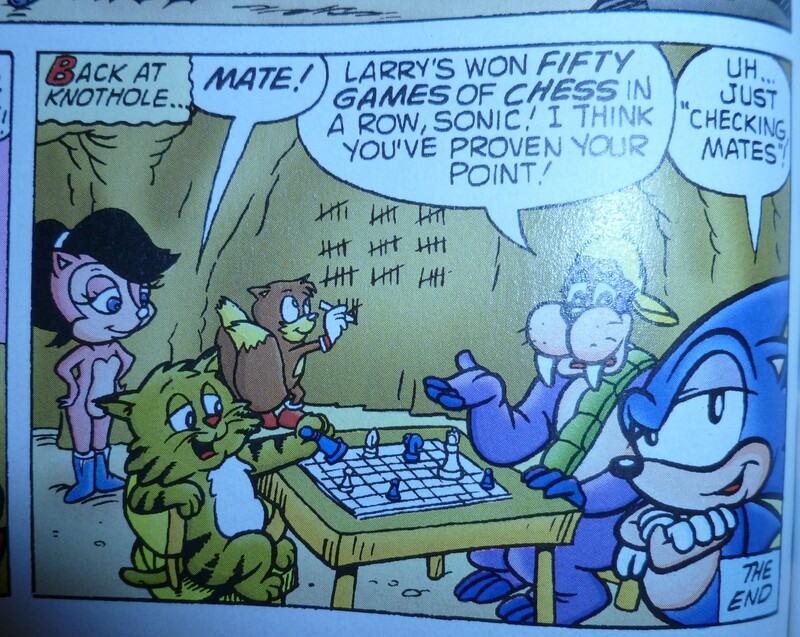 But the real problem is how Sonic’s going to get back to his own time and help his friends! Sonic takes a shortcut and accidentally lands in the nest of a cranky old eagle. 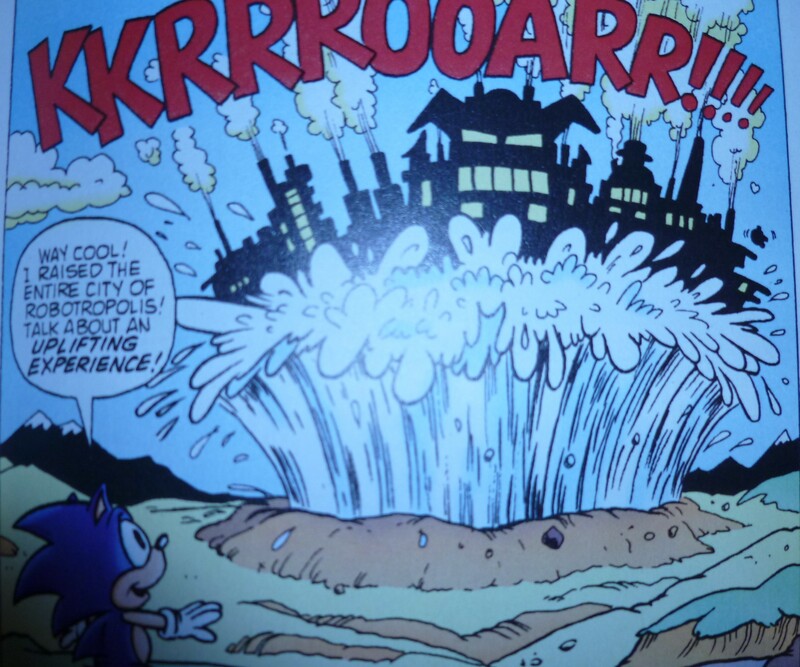 Robotnik and Snively discover their location and send a massive ram robot to destroy Sonic and his Eagle friend. – Sonic convinces the ancient Freedom Fighters to get to the surface world and get some fresh air. He also convinces them to plant some bushes and trees, implying the creation of present day Mobius’ Great Forest. The stories in Volume 3 are excellent, front to back. Each issue blends a story of light-hearted feeling with one of more serious topics. The first appearance of Evil Sonic is a nice introduction too, as he is one of the more interesting villains for the entire series (you’ll definitely see more of him later). Food For Thought is also one of my personal favorite stories, because it is just ridiculous enough and has some great artwork. Included with the standard “Who’s who” at the end of the volume, series artist Pat “Spaz” Spaziante takes us through how he creates a cover for each volume of Sonic Archives. It’s a nice touch and very welcome extra that I’m saddened they don’t do more of. 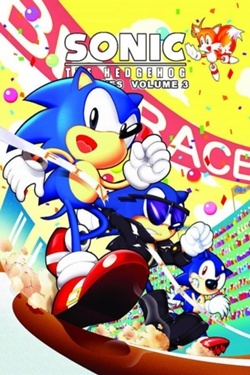 Each consecutive volume up to this point has gotten better, and Volume 3 is a fantastic collection of early Sonic stories. Buy this comic from Amazon!